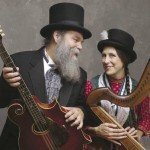 The Curtis and Loretta Christmas show will be on December 15th. They will perform a special Christmas Concert in period costume featuring all your favorite Christmas songs performed in their award winning style! Doors open at 6:00 p.m. Adults $8, kids $5. Visit http://ginridge.com/extras/hickory-ridge-concert-series/ for information about the artists.